Product prices and availability are accurate as of 2019-04-02 15:27:10 EDT and are subject to change. Any price and availability information displayed on http://www.amazon.com/ at the time of purchase will apply to the purchase of this product. Lexmark 100XL Black, Cyan, Magenta, and Yellow High Yield Ink Cartridgess - Individual ink tanks allow for more control over the ink you use--replace only the color you need. Enjoy water-resistant laser sharp text with precise, consistent drop placement. Vizix print technology delivers vibrant, crisp prints from the first print to the last. 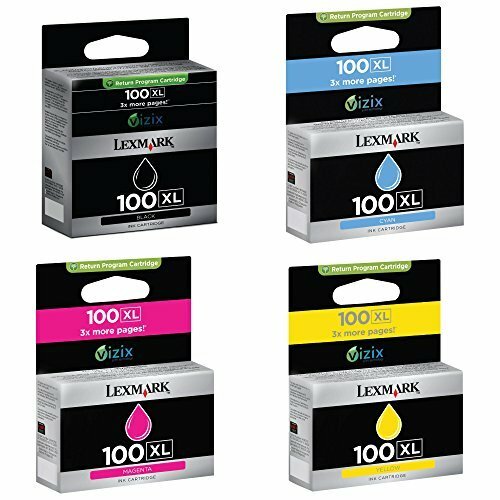 Lexmark 100XL Black, Cyan, Magenta, Yellow Vizix print technology means vibrant prints. Water-resistant. Individual ink tanks.